The phenomenon of the puppet theatre in Slovakia is linked historically with the European tradition of the ‘wandering theatre’ groups (not only puppetry groups) which travelled all over Europe from the 16th century. Back then theatre artists used to wander because the existence of permanent theatres was not very usual. The name comedians was taken over from wandering English theatre groups which were officially called comedians. This historical name was then applied to wandering actors in Central Europe. In those days actors-comedians used to perform in two different ways – live in person or alternately – live in person and with puppets. They performed the same repertoire, both with and without puppets. This repertoire was aimed at adults, so the puppet shows also covered operas, popular plays about lives of the Saints, and stories about knights, which would have been popular with adult audiences. Puppet theatre for children appeared much later, arriving in Europe during the 19th century and only reaching Slovakia in the 20th century. The change of the viewer can be attributed to several reasons. The old form of marionette theatre was not further innovated, a lot of damage was caused by the First World War and cinematography was discovered at the beginning of the 20th century and proved a partial competitor to the travelling theatre companies. 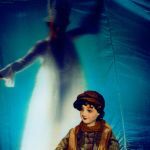 At this time the owners of puppet theatres in which the protagonists of plays were marionettes hung on strings or wires and manipulated from above began to perform their plays for children and change some of their puppets for a new medium, the cinematograph. The older generation – our grandparents and great-grandparents – still remember the era of the wandering comedians who travelled in Slovakia in the first half of the 20th century. For the above mentioned reasons they became tradesmen. Theatre people changed into the owners of so-called entertainment venues. Existential reasons forced them to add carousels and shooting areas to the puppet theatre. The present puppet theatre makers, graduate theatre professionals, are quite different from the old wandering comedians. The only things they have in common with them are perhaps the puppet and history. 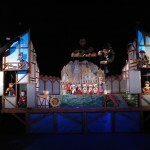 The concept of the modern puppet show is connected mainly with repertoire for children and young people, and such children’s entertainment remains the overwhelming practice in the modern professional puppet theatres of Slovakia. However, apart from plays for children, some creators in the professional puppet theatres and private theatre companies which perform with puppets for children also present specified stage plays and visual experiments based on new practices of recent figurative, material or design theatre. 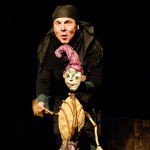 The puppet is now in Slovakia, but especially in the world, a very popular and frequently used element especially in dance theatre and other artistic and non-artistic kinds for adult and youth audiences (e.g. drama, film, often even advertising). The puppet and puppet theatre is also used in education, in healing processes like art therapy etc. The puppet theatre and its varied forms have reached a noteworthy stage of development in Slovakia. Creators make full use of the wide possibilities and elements the puppet theatre has to offer. The puppet represents much more than merely a marionette copy of a human. Puppetry is a modern art form which uses the properties of materials such as fabrics, common utility objects, natural materials, modern improvised abstract puppets made by a designer, or simply light that can be a theatre figure and protagonist, as it can run, hide and guilefully wink at the audience. The puppet theatre of today is connected with concepts like metaphor, imagery and imagination. It is open and attractive, not least for its unlimited options of expression, which begins with the classic or modern puppet and ends with the body language of an actor on stage. Its artistic attractiveness and styling excites. Puppet theatre makers, both actors and directors, are some of the most flexible artists working today in the fields of dubbing, television, radio and cinema. Other theatre genres also draw inspiration from modern puppet theatre, particularly its metaphoric nature and symbolic expression. The 20th century brought a very positive and accelerated development for the puppet theatre in Slovakia, and the present generations of Slovak artists continue to cultivate this noble but among the general public, not so familiar genre.